Raz Fresco Puts On For The City. Artist Interview. During NXNE I was able to see Raz Fresco play at the Drake Underground on June 18th. I didn’t know what to expect as this was my first time seeing him in concert. I’ve been hearing more and more about him as he is about to release his debut album Pablo Frescobar on July 1st. On Canada Day Raz Fresco will show the world his story and how amazing the hip hop scene is in Toronto. That is exactly what Raz is all about, bringing the spot light to Toronto and always being loyal to his home town. After the show I was able to talk with him for a few minutes (shouts out to Big Soze for setting this up). I wanted to know what it was like for him to play NXNE this year. What’s it like playing north by north east? Through his whole set you can tell just how much he represents for the city. It’s great to see artists like him putting on for the city and bringing back that hip hop spot light to Canada. Just like Toronto, Raz Fresco’s buzz has been steadily growing. Speaking about your album coming out July 1st what can people expect from it? When he said that the album is almost entirely self-produced my jaw dropped. Not many rappers produce their own tracks let alone most of their album. Raz Fresco is also known for producing beats for other rappers like Tyga, Mac Miller, French Montana and many more. But recently he’s been focusing on his debut album Pablo Frescobar. How many songs did you have for the album? Did you have a ton of songs you had to go through? As we talked I could hear the determination in his voice. Even though he spent years workings on this album you can tell this is just the tip of the iceberg. The release of Pablo Frescobar will keep his momentum rolling and it’s up to him how far he takes it. Talking to Raz you can tell he knows exactly where he wants to be and how to get there. I ask him if he has a favourite concert venue to play in and he gave me an amazing answer. Do you have a favourite venue in the city to play at? That’s probably the best answer I have heard to that question. This made me realize he’s doing this all for his love of music and seeing people jam out to the songs he’s created. Raz Fresco is a true artist who loves to have his art displayed and have people relate to it. With Raz Fresco being a part of the ever growing scene here in Toronto I wanted know his thoughts on the ever growing scene. What do you like the hip hop scene in Toronto right now? And that’s exactly what he is doing. 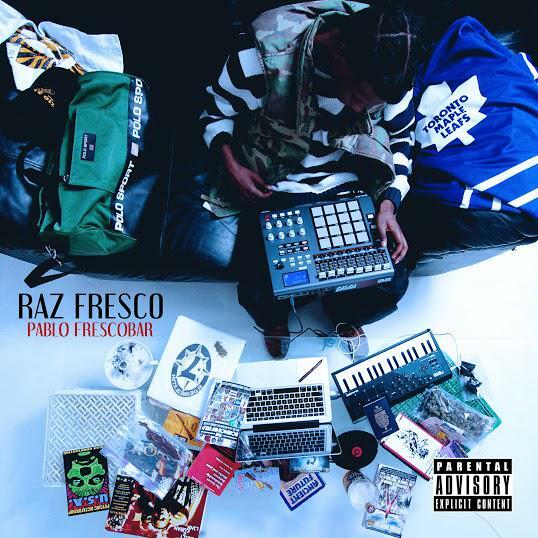 Raz Fresco is extremely focused and is ready to take over the scene with his album Pablo Frescobar. He has all the skills and determination to become one of the best it’s only a matter of time. ← My First Full Day At NXNE. Concert Review.